The northernmost district of Kerala, Kasaragod is situated on the seacoast with the Western Ghats in its eastern and northern borders. Backwater trips on the Chandragiri River and at Valiyaparamba are fascinating experiences. Chandragiri: It is located 4 Km from Kasaragod town. Situated on the Chandratiri River, southeast of Kasaragod town, this town in known for the large 17th century Chandragiri Fort, one of a chain of forts. It offers a breathtaking view of the river and the Arabian Sea. It is a vantage point to watch the sunset. 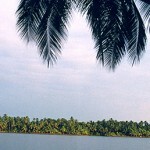 Boats trips to nearby islands and palm groves are available. Shanghumukham: It is located 8 km from Thiruvananthapuram city. Shanghumukham is adjacent to the Thiruvananthapuram airport and Veli Tourist Village. A 250 m long tiled walkway adorns this beach. Provided with granite seats, it is a favourite haunt of sunset watchers. An indoor recreation club, the matsya kanyaka (a gigantic, 35 m long sculpture of mermaid) and a restaurant shaped like a starfish are other attractions here. 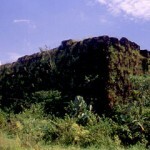 Pallikere: It is located 1 km from Bekal Fort. This enchanting beach offers a spectacular view of the fort and has ample facilities for recreation and relaxation. 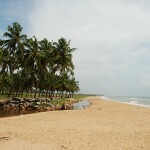 Kappil: It is located 6 km from Bekal Fort. Remote and secluded, this beach is fast becoming a major tourist attraction. The Kodi cliff nearby offers a panoramic view of the Arabian Sea. 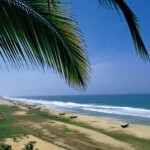 Varkala: It is located 40 km from Thiruvananthapuram city. Varkala is a seaside resort and spa, as well as an important Hindu centre of pilgrimage., High cliffs with rich mineral springs rise majestically from the coastline. The 2000-years old Sree Janardhana Swamy Temple and the Nature Care Centre are the two main attractions here. Valiyaparamba: It is located 30 km from Bekal Fort. This is perhaps the most scenic backwater stretch in Kerala. Fed by four rivers and dotted with numerous little islands, Valiyaparamba is a much favored backwater resort that offers enchanting boat cruises. Kovalam: It is located 16 km from Thiruvananthapuram city. Internationally renowned beach has been a favorite haunt of tourists since the 1930s. 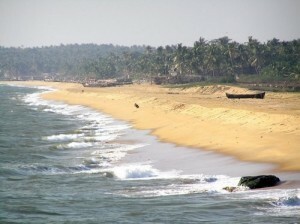 Kovalam consists of three adjacent crescent beaches. The southern most, known as the Lighthouse Beach, is the most popular. 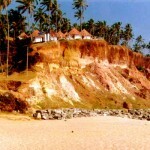 Kovalam offers accommodation options that suit all budgets. This entry was posted in Kasaragod, Kerala and tagged Chandragiri, Kappil, kasargod, Kovalam, Pallikere, Shanghumukham, Valiyaparamba, Varkala. Bookmark the permalink.